Do you wish Chocolate had a National Holiday every month so you had an excuse to celebrate? I know I would! I’ve loved chocolate since I was a kid. It was and still is my go-to flavour for ice cream and cake. But then, while attending Le Cordon Bleu, my love for chocolate grew more. Our teacher introduced us not only to Opera cakes and chocolate Bûche Noël, but to delicate chocolate pots de crème. These silky custards are simply one of the easiest desserts you’ll ever make and also one of the most impressive ones. With just a handful of ingredients and little baking time, you’ll have a dessert that’s nothing short of a dream. Pots de Crème are about convenience. 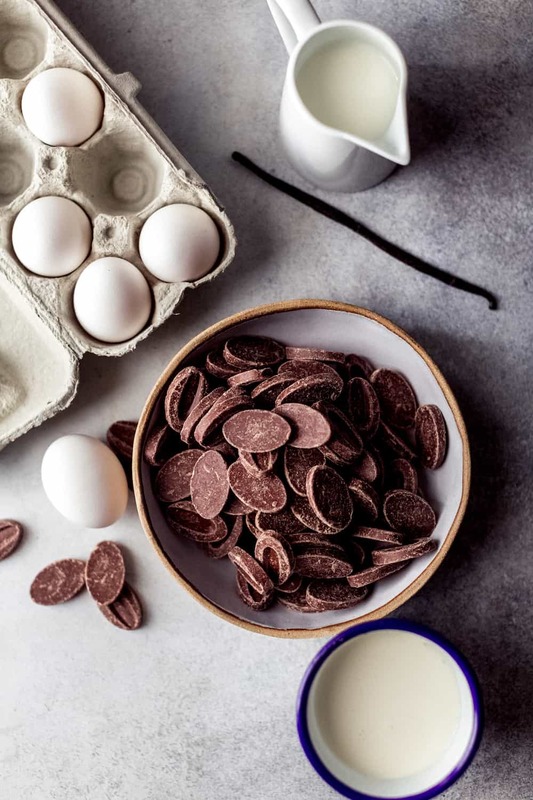 You should make them the day before you plan to serve them, so when it’s time for dessert, all you have to do is pull these chocolate gems from the fridge and decorate them. 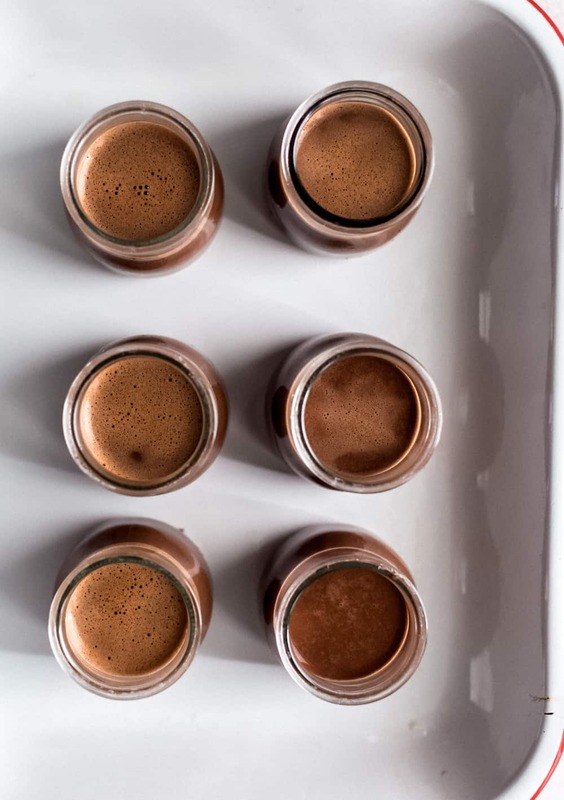 But before we start making these Chocolate Pots de Crème, there are a few things that will set you up for success. Trust me, they are ridiculously easy to make. 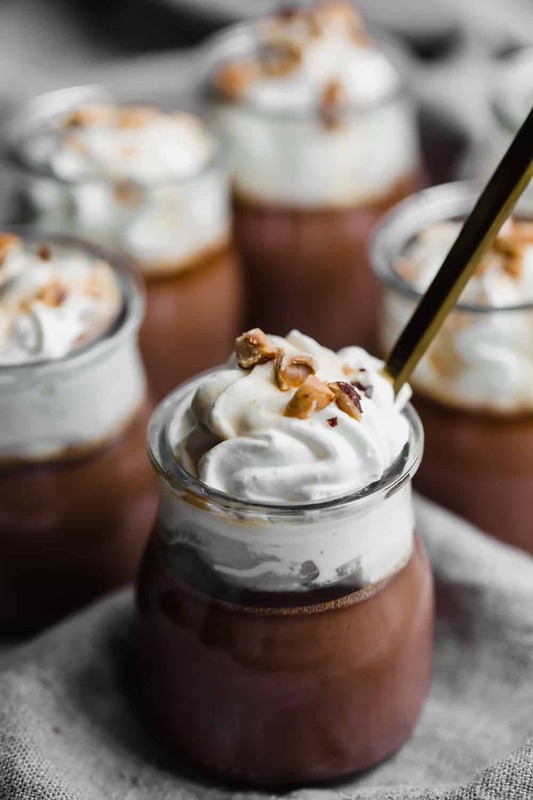 For this recipe you want to use THE best chocolate you can find. It will give you the best results as it will blend smoothly with the rest of the ingredients and the taste won’t be compromised. On these Pots de Crème it’s the only ingredient that you might not have in your pantry, but can be easily ordered online. I used Valrhona Bahibé, a fruity single origin from Dominican Republic (hi beautiful birth country!) This chocolate is perfectly balanced and has a high cocoa content. It enhances the smoothness of the milk with intense notes of cocoa before revealing its fruity tanginess. As you’ll see later on the recipe, you’ll have to whisk all of the ingredients together. You want to whisk thoroughly but gently. Rather that aerating the custard, you simply want to gently mix all the ingredients together. Vigorous whisking can create an uneven surface on the pots de crème instead of a smooth one. Be sure the water for the water bath is very hot when you add it. This will keep the custards at a consistent but gentle heat as it goes from the stove to the oven. I like to have some boiling water ready, pour the Pots de Crème in ramekins and place them in a baking dish. After they are in the baking dish, I slowly pour the water until it comes halfway up the outside of the ramekins. Back in 17th century France, Pots de Crème were originally served in small porcelain cups. Nowadays, there’s room for improvisation. For this recipe, you can use 4 ounce ramekins or if you keep small yogurt jars (I kind of have a collection!) like I’ve used here, they work perfectly well. 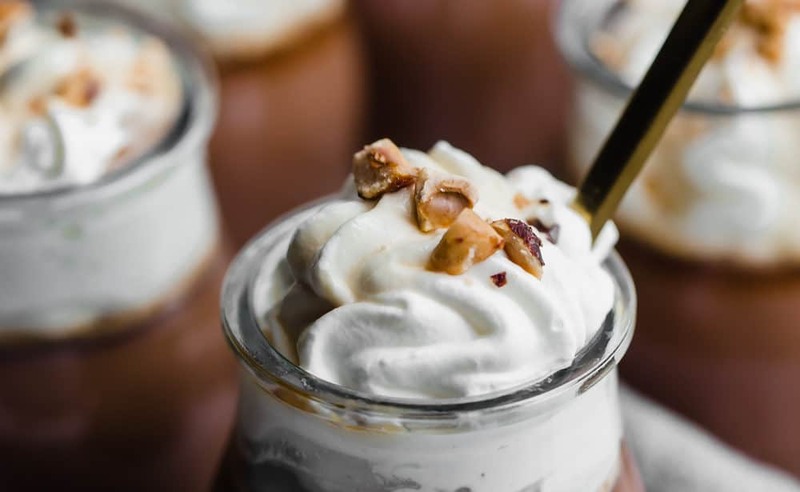 You can have them on their own, but they are wonderful with a dollop of freshly whipped cream, and if you feel like going the extra mile, toast some almonds or hazelnuts, crush them with a rolling pin and sprinkle them on top of the whipped cream just before serving. Chocolate shavings are amazing on it too. 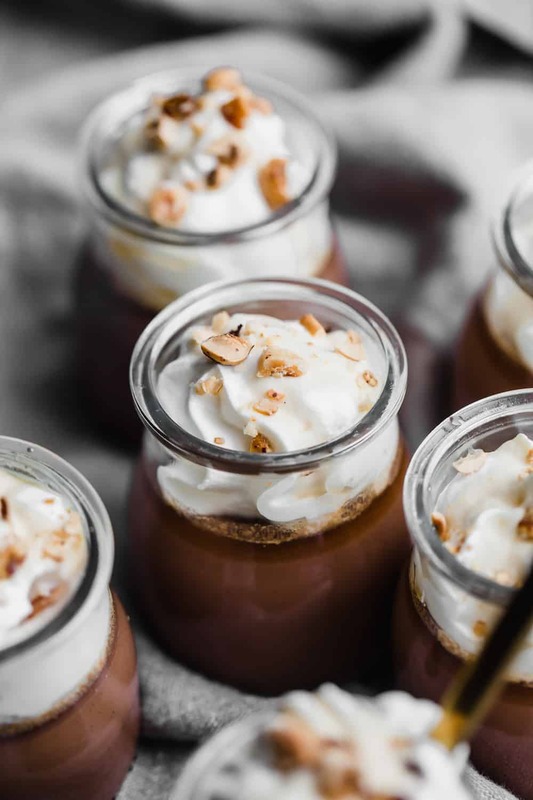 If you are looking for an easy and delicious dessert for Valentine’s or for your next dinner with friends at home, these unapologetically rich chocolate pots de crème will make everyone happy. If you try the recipe, let me know what you think! Leave a comment bellow or take a picture and tag me at #dialaskitchen on Instagram. Put the chocolate in a medium bowl. Heat the cream, milk, vanilla and salt in a small saucepan over medium heat. When it begins to simmer, remove it from the heat and pour it over the chocolate. Stir gingerly with a whisk until smooth. In a medium bowl, whisk together the egg yolks, then whisk in the sugar. Gradually add the melted chocolate mixture while constantly whisking until well- blended. Strain the mixture into a large measuring cup or another bowl. Place 6 ramekins, custard cups or small glass jars a baking dish or roasting pan. Divide the custard amongst the ramekins. Add boiling water to the baking dish until it reaches halfway up the outside of the ramekins. Cover tightly with foil and carefully place the baking dish in the oven. Bake until the custards are set around the edges but still slightly soft and jiggly if you nudge them, about 30 to 35 minutes. Make sure you check them before as ovens can vary. Remove the pan of pots de crème from the oven, and carefully lift off the foil. As soon as the pots de crème are cool enough to handle, remove them from the hot water and place them on a cooling rack. 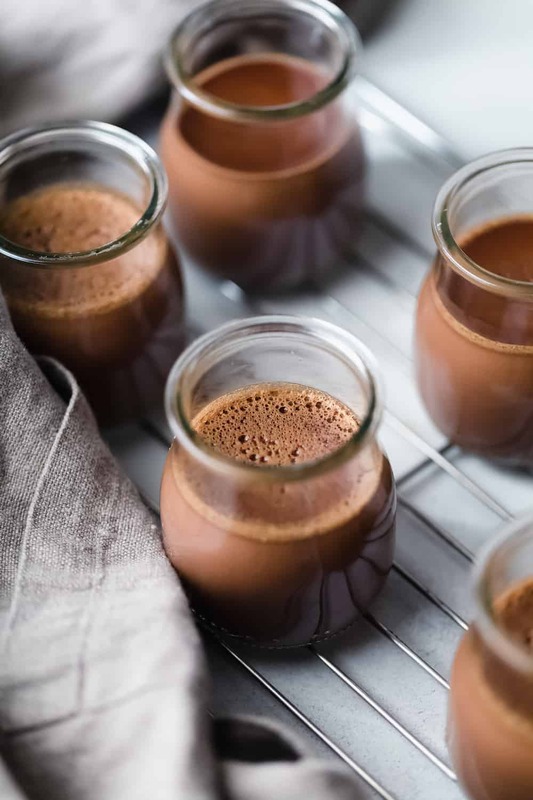 The Pots de crème can be enjoyed at room temperature, but I prefer to let them rest in the fridge for a few hours or overnight.